Open from 12pm to 10pm from Tuesday to Sunday. 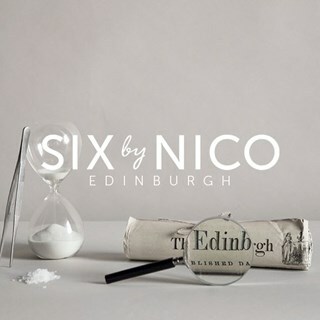 Six By Nico will be a home to a series of carefully curated and constantly evolving restaurant concepts. Each six weeks, Nico and his team will serve a new six course tasting menu - each one themed upon a different place or memory. Enjoyed the experience but was very disappointed at the end to be told to pay and leave as you needed table within 5 minutes. I don’t think that’s the way to treat guests when they have paid £70 per head. It brought a sour taste to an enjoyable evening. It would put me off coming again. I expect to be able to relax after having such a tasty meal. Took our son for the first time as a treat for his 13th birthday and he loved it! All waiting staff were great but Ryan stood out with us friendliness & sense of humour. Really loved it. Delicious menu and very good value for money. Will go again once menu changes. We thoroughly enjoyed every aspect of our evening! Exceeded my high expectations. Complementary Prosecco for my dad’s birthday was a lovely touch. Friendly staff and delicious food. As ways, delicious food and excellent service. We were celebrating our wedding anniversary and wanted somewhere a bit special. We certainly found that at 6 by Nico. We loved the concept of the menu changing every 6 weeks and also the different themed menus. We loved the flavours that burst in our mouths and the wine flight complemented each course. The sommelier explained the different wines really well. Excellent. High quality food and a unique concept. A lovely tasting-menu late lunch that ensured we were much more adventurous with our meal than we would otherwise have been. Will definitely be returning. portion sizes are ridiculously small; I left hungry and disappointed. To add insult to injury having your server ponitificate about each course when a magnifying glass is required to identify food on the plate, is frankly embarrassing. Not too posh lol. Relaxed atmosphere with beautiful and delicious dishes from start to finish. Quirky. Will be back for sure. The Orient Express culinary journey was fantastic! First visit to the restaurant. Had a great time. The menu was fantastic and the staff were very friendly. Highly recommend Six by Nico. We will be back. Very enjoyable lunch experience - food was lovely. My stand out dishes were  the pork and the dessert although everything was well presented and very tasty. Portions just right. Saw comments about the restaurant being noisy but we enjoyed the buzz of the place. Served by very knowledgeable waiting staff who explained all dishes and accompanying wines. We will be back. I really enjoyed this menu, I’ve been to a few different ones but this was my favourite! It was just so creative and delicious. The service we received as well was incredible, could not fault it one bit. We had a fabulous night. The food was superb, the staff were knowledgeable and friendly. We will definitely be back!!! Great celebration and a glass of Prosecco on the house as it was my dads birthday was a lovely treat. Thank you.